Drifting a car might not be the quickest or most efficient way around a race track, but that doesn’t mean cars made for going sideways aren’t capable of going fast. To prove the point 2010 Formula Drift champion Vaughn Gittin Jr. and current NASA American Iron regional champion Chris Cobetto got together with their Ford Mustang RTR drift and race cars and had some fun at Summit Point Raceway in a competition of Drift vs Grip. After a standing start it’s easy to see that Gittin’s drift car is quite a bit faster in a straight line thanks to its lighter weight and slight advantage in horsepower. Cobetto’s Mustang, built specifically to go fast around the track, is faster in the corners, though, and manages to get the edge on Gittin coming out of the apex. As for who crosses the finish line first…we’ll let you watch for yourself. 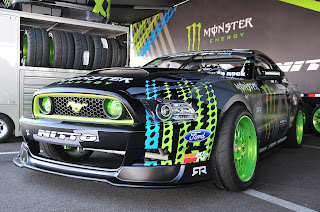 This entry was written by by MustangsDaily (Mustangs Daily) and posted here on Thursday, August 23rd, 2012 at 4:00 pm and is filed under chris cobetto, drift vs grip, ford mustang rtr, mustang rtr, vaughn gittin jr., Videos. This article was not written by us, rather gathered using RSS feeds listed here. We take no credit for this article. You can leave a response, or trackback from your own site.